PHOENIX — The California-based solar panel company, SolarCity, has committed to spending at least $3 million to put a measure on Arizona’s November ballot that would require paying retail rates for rooftop solar net metering, and prevent new fees or demand charges the solar industry claims are prohibitive. But millions more are flooding into a signature gathering sleight-of-hand that aims to prevent the measure from ever making it to the ballot. Summit Consulting Group, a political consulting firm with ties to Arizona Public Service, is paying Sign Here Petitions to collect survey signatures, but only on the condition that signature gatherers sign a non-compete clause, promising not to work on SolarCity’s initiative, and rescinding their registration as a signature gatherer on the SolarCity ballot measure if they’ve already begun working on it. And Sign Here Petitions is paying its signature gatherers an unusually high rate of $7 per signature, two dollars more per signature than what another firm is paying signature gatherers on behalf of SolarCity. Beyond paying a higher rate for signatures and ensuring that the gatherers can’t work on the SolarCity initiative, they’re being paid to work on a survey that cannot amount to a ballot measure, as SolarCity’s does. 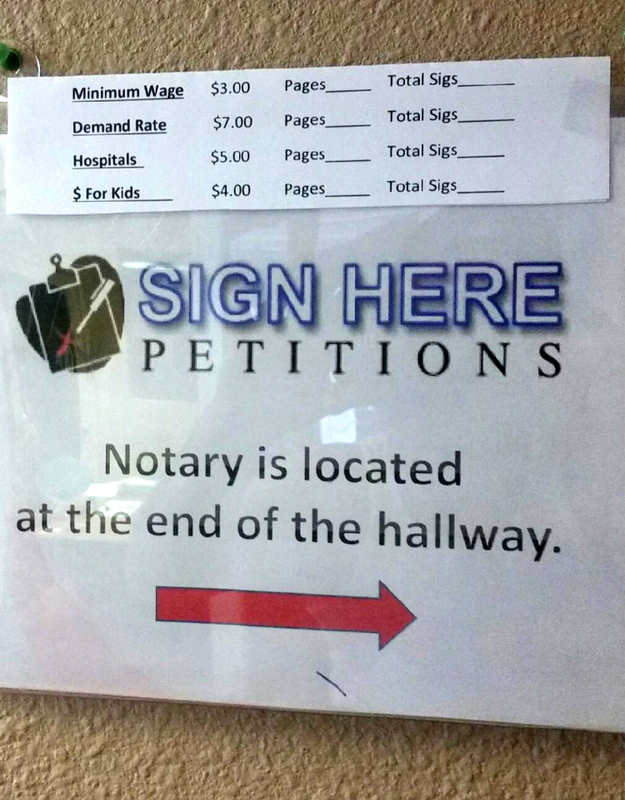 While the petition forms resemble ballot measure signature forms, it’s nothing more than a survey. Matt Roberts, a spokesman for the Arizona Secretary of State, acknowledged that the Summit Consulting Group survey is not the kind of petition strategy that actually leads to qualifying an initiative for the ballot. The survey asks signers to declare that they support demand charges being imposed by utility companies, in order to have rooftop solar users pay for fixed costs they avoid when using solar panels. The idea is one that’s been supported by traditional utilities in the current political fight over solar panels. Copies of the non-compete contract provided to the Arizona Center for Investigative Reporting present a threat of a restraining order or injunctive relief if the signature gatherer were to collect or attempt to collect a signature on the SolarCity initiative. Representatives of Summit Consulting Group would not respond to multiple requests for comment on the contract or the signature gathering effort. Bonita Burks, the owner of Sign Here Petitions, also did not return multiple requests for comment. Andrew Chavez of Petition Partners—one of the three main signature gathering firms in Arizona, and the one working for the SolarCity-backed initiative—estimated that $7 per signature would cost the group paying the firm between $10-$15 per signature, given other costs, overhead and margins. Chavez estimated Sign Here Petitions can produce around 10,000 signatures per week, on a ballot measure petition. But with a survey such as the one being circulated, there is no requirement to produce valid signatures. Chavez said that when he has had a survey that doesn’t require signature validation, signature gatherers can be expected to produce signatures twice as fast. “In theory, circulators could have their kids sign it. They could have felons sign it. They could have people who don’t live in Arizona or who aren’t registered voters sign it,” Chavez said. Jason Rose, a political consultant who has worked on behalf of the solar industry for years, said APS was behind the same kind of effort in 2014, but that the company was caught off guard this year. Rose said the move isn’t unusual for APS, and that when they run into political problems, they put massive amounts of money into political efforts. In 2013 APS admitted to spending $9 million on a public relations effort during a fight over net metering and deregulation. Kris Mayes, a former Arizona Corporation Commissioner who is running the SolarCity-backed initiative, did not respond to requests for comment. Court Rich, an attorney who works for SolarCity said it’s logical to conclude that the effort to stymie the SolarCity ballot measure comes from APS. The latest conflict over signature gathering efforts comes after years of tension, accusations and public relations wars between third party solar companies and traditional utilities, over how solar panels should be regulated. APS and other utility companies say the solar companies are looking to make money quickly, without any consideration of how it affects the larger electric grid ecosystem. The solar companies say traditional utilities are accustomed to monopolistic control of the energy market and are looking to keep any outsider from being able to compete.